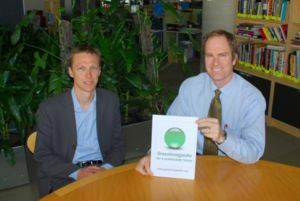 Melbourne City Councillor Fraser Brindley and Peter Campbell launched Greenlivingpedia, a free resource for sharing information about green living and building at Melbourne’s innovative CH2 building on Monday 15 October 2007. "Today I am launching Greenlivingpedia, an important resource that enables everyone to create and share information about green living and green building, such as the CH2 building," Cr Brindley said. 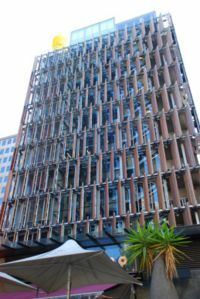 "Melbourne City Council’s innovative CH2 building provides an excellent example of how we can design and build for a sustainable future," Cr Brindley said. "Greenlivingpedia is a wiki website similar to Wikipedia that anyone can use to create and edit articles about their own sustainable living project or area of interest,” said Peter Campbell, the founder and creator of Greenlivingpedia. "I created Greenlivingpedia to complement and link to Wikipedia and other information sources on the Internet so that people can view and create examples of green living and green building solutions," said Mr Campbell. "Issues like climate change and reducing our energy footprint are now major concerns in the community with the focus now shifting towards what we can do to address them. Greenlivingpedia can play an important role in empowering our community to take local action on climate change and sustainable living," said Cr Brindley. "Greenlivingpedia provides a mechanism for people to collaborate and share information about a range of topics including sustainable house and building projects, energy saving tips, green computing, solar power, community action, water conservation and recycling" said Mr Campbell. "Many people ask for more information about our sustainable house renovation in Surrey Hills so I have written an article on Greenlivingpedia with details of what we have done and how much energy we have been able to save," said Mr Campbell. "Wikis and blogs are dramatically changing how we can work together to create, access and share information on the Internet. Photos and images, and even video and interactive maps can be easily added to Greenlivingpedia articles, and the articles will appear in search engine results," said Mr Campbell. Peter Campbell is also running for the Greens for the seat of Kooyong in the upcoming federal election. This page was last modified 12:46, 30 October 2007.